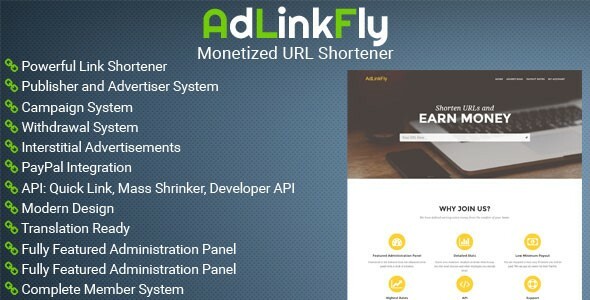 AdLinkFly v3.1.1 - Monetized URL Shortener - CODELISTPRO | Free Premium Scripts, Plugins, Apps Source Code. Earn money by starting your own monetized link shortening service, just like ouo.io, linkshrink.net, adf.ly or shorte.st! Allow members to shorten links & earn money, and keep a share of the profit. AdLinkFly includes a complete publisher and advertiser system, campaigns, withdrawals, API, translation ready, PayPal integration, reCAPTCHA integration and much more!